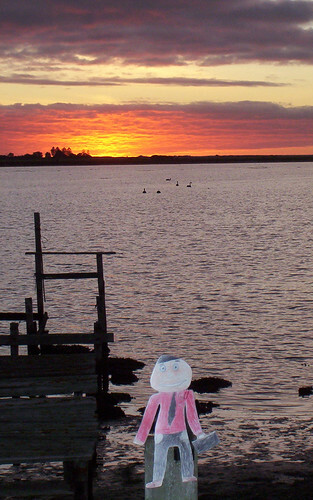 My first night on Hindmarsh Island was very exciting. My hosts Vicki and David are members of the local volunteer fire service. 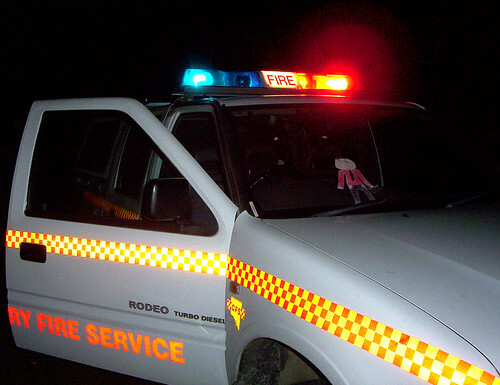 David is a Group Officer and he had the Country Fire Service Command car at their house. I got to drive the Command car with the lights flashing in the dark. It was so exciting. But a funny thing is that the Aussies drive on the other side of the road and I kept getting in the passengers side to drive. The steering wheel is on the right-hand side. The next morning I watched the sun rise over lovely Mundoo Channel on Hindmarsh Island. This is my host home and it is so beautiful. I didn't have to get up too early as the sun rose at 7.25am that morning. It is winter time here and they never have snow. And I saw the strangest things in the water on the channel. They were black swans. Australia doesn't have white swans at all. Their swans are black with white under-tips on their wings. You only see the white as they fly overhead. 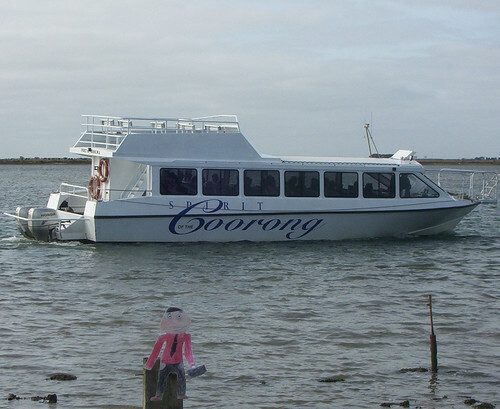 Later in the morning a tourist boat left from Mundoo Channel to take people up the Coorong to see this RAMSAR protected area and look at birds, the Murray Mouth, the ocean and Aboriginal midens. I waved at the people on the boat. And they waved back. 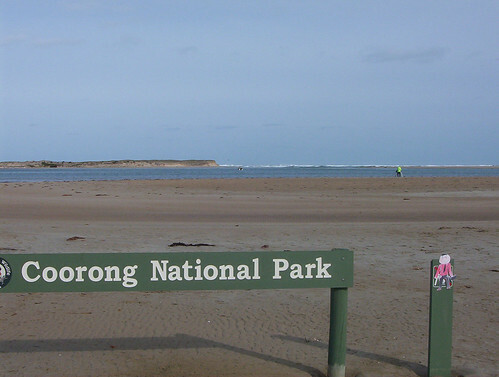 After Vicki and I had lunch we walked over to the Murray Mouth. This is where the largest river in Australia, called The Murray River finally finishes its long journey through Australia and exits to the Southern Ocean. People were fishing there and there is a lookout over the beach. The waves on the ocean side of the mouth were roaring. The Murray mouth is very dangerous for boats to go through and there have been many boats lost and overturned and lives lost, especially in the early days when there were paddle-steamers. We talked to a nice lady and her grand-daughter while we were at the mouth and told her about my travels from Tennessee.